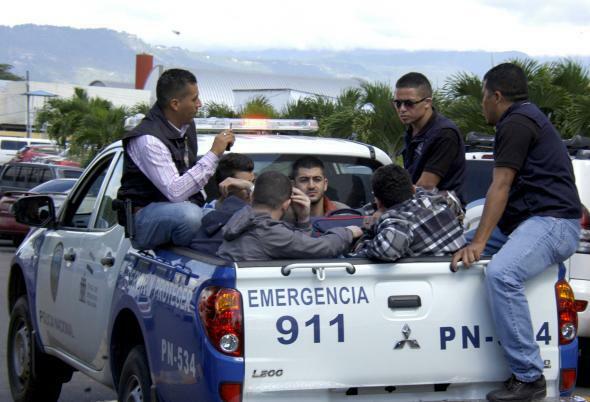 Five Syrians with stolen Greek passports arrested in Honduras. Honduran police with five Syrian men who were arrested at Toncontín Airport in Tegucigalpa, Honduras, on Wednesday after arriving with stolen Greek passports. The five were detained after arriving on a flight from neighbouring El Salvador on Tuesday night, police said. … According to Honduran police, they were planning to travel to the northern city of San Pedro Sula. From there, they intended to cross into Guatemala and then Mexico before reaching the US border, some 2,000km (1,200 miles) away. While most of the men identified as perpetrators of Friday’s terror attacks in Paris were French nationals, fingerprint evidence indicates that one of the Stade de France suicide bombers traveled to Paris via Greece using a fake Syrian passport; alleged attack planner Abdelhamid Abaaoud was also able to travel to Europe from Syria at some point before the attacks via methods that are as of yet unknown.